Google’s new experimental project is inventing ‘Smart contact lenses’ to help people with diabetes to manage their disease by measuring the glucose levels in their tears. At present, most people with the disease monitor their glucose levels by testing drops of blood. It’s early days yet but a tiny wireless chip and miniaturised glucose sensor is to be embedded between two layers of lens material. It will continuously monitor the level of glucose in the bloodstream and relay that information to a smartphone or computer. This will prevent the more serious side effects before they occur and best of all, there is already a prototype. This will be great news I am sure to those suffering with the disease. Crazy or not so crazy? This got me thinking about contact lenses in a more progressive and dynamic way. My imagination steered me into thinking about Terminator and what a bionic lens could do for me in the future. Ultimately, I would want this lens to detect whether or not my daughter is telling porky-pies and in the event of a fib, my contact lens would send flashing red lasers directly at her!! Well, maybe that is a bit far fetched but this lens could be used more intelligently than for demonising children! The lens itself could determine whether a person is lying to you by informing you of their body language, heart rate and listening to the tone of their voice. Perhaps it could go on to be a love detector (not sure I would want that on an early morning commute!!) More intelligently, the lens could detect pupil dilation which would reveal a lot about what goes on in our minds. They say that our eyes are the windows to our soul. However, as far fetched as all this sounds, in actual fact it is not such a distant reality as you may first think. Some of this kind of technology already exists in some fitness games using Kinect 2.0 on Xbox One. The Kinect sensor is capable of inferring your mood from facial expressions, estimating your heart rate from the colour of your skin and it even has sophisticated voice recognition. Unbelievably, the Kinect 2.0 has the ability to see in the dark. These lenses would give me (and of course everyone else) X-ray vision for reasons I need not go into. We are all naturally intrigued by looking inside something (or someone). Night vision would equally be an obvious advantage but more importantly the lenses could help save the planet by lessening environmental damage. Not to mention the drive home would be much safer on a dark Winter’s night. This lens could tactfully advise me that I have exceeded my calorie/alcohol limit so from that point onwards I have the option to refrain from consuming anything else. Sadly though, it is unlikely that I would be affected by such draconian information, but I am convinced that it would work for those with slightly more willpower than myself. Taking this concept a stage further and to a more informative level, this lens could automatically scan what I am about to eat and/or recognise the barcode or food packaging. The information would quantify the nutritious substance without having to input data on one of the many calorie-counting smartphone apps that are all the rage right now. Overall, it may help me make more informed choices. This idea is probably a more male orientated suggestion (in fact it was suggested by a male colleague) but as well as X-ray vision what if I could use my lens as binoculars? This way I could walk to my local beach and see what my partner is doing working on the largest offshore windfarm in the World – The London Array. Or more interestingly for some, they could be just like Superman and read small text from miles away!! What if my contact lens replaced my need for Satnav? Furthermore, I wouldn’t have to listen to the awful voice that I have on mine. I could take myself off on country walks without the fear of getting completely lost. With voice recognition I could tell my contact lenses where I needed to go or better still just use my thoughts and with a combination of GPS and visual recognition it could recognise landmarks or signs, then give me clear directions with arrows in a virtual HUD (Head’s Up Display) directly in my vision. This would be great tool for when I go on holiday abroad because I wouldn’t need to worry about being unable to read signs or menus in restaurants again. The contact lens could prevent me from feeling like an idiot! The lens would automatically translate the words directly in my vision. This technology already exists to a large extent because we have translation Apps that have dramatically improved over time and are even capable of translating complicated sentences. In fact many Apps allow you to skip typing thanks to advances made. For example, ‘Word Lens’ is impressive in the way that it translates words in real time on your screen. It replaces the words that you are looking at with translation: Not only are many of the Apps free but they also lighten the suitcase. The VDU would replace my need for computer screens all over my desk by displaying all my visual content directly onto the retinas of my eyes. Although I am not entirely convinced by this idea it would effectively replace my vision of the world with whatever the computer needs to display to me It would make it ideal for video games or web browsing. I could be transported into a realistic virtual world in just the same way Occulas Rift can do now, but without the need to wear the bulky headset (Read the book Ready Player One… it’s excellent!!!). 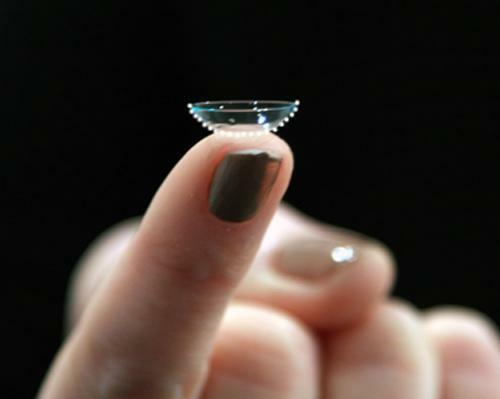 Do you have a favorite bionic contact lens of the future? If so let’s us know in the comments below.